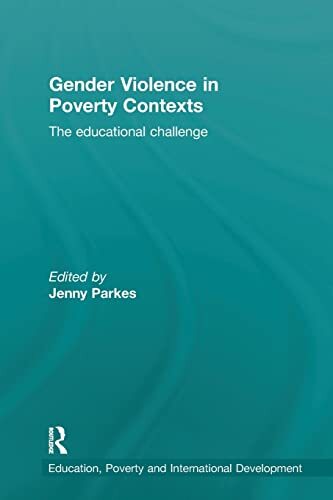 This book is concerned with understanding the complex ways in which gender violence and poverty impact on young people's lives, and the potential for education to challenge violence. Although there has been a recent expansion of research on gender violence and schooling, the field of research that brings together thinking on gender violence, poverty and education is in its infancy. This book sets out to establish this new field by offering innovative research insights into the nature of violence affecting children and young people; the sources of violence, including the relationship with poverty and inequality; the effects of violence on young subjectivities; and the educational challenge of how to counter violence. to investigate how institutions, including schools, families, communities, governments, international and non-governmental organisations and the media constrain or expand possibilities to challenge gender violence in the Global South. Describing a range of innovative research projects, the chapters display what scholarly work can offer to help meet the educational challenge, and to find ways to help young people and those around them to understand, resist and rupture the many faces of violence. 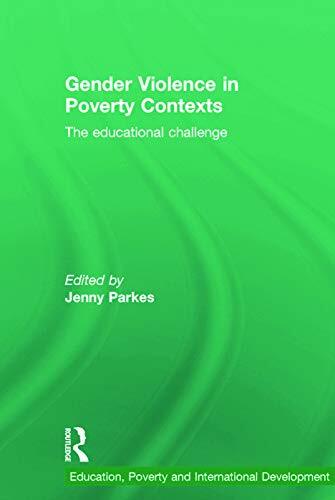 Gender Violence in Poverty Contexts will appeal to an international audience of postgraduate students, academics and researchers in the fields of international and comparative education, gender and women's studies, teacher education, poverty, development and conflict studies, African and Asian studies and related disciplines. It will also be of interest to professionals in NGOs and other organisations, and policy makers, keen to develop research-informed practice. Jenny Parkes is a Reader in Education at the Institute of Education, University College London (UCL Institute of Education), UK.